Hemp vs. Marijuana - What are the Key Differences? With legalization spreading and more and more cannabis products finding their way into your home, the line between hemp and marijuana is getting more confusing. You’d think it would get easier, as more information becomes available, but it’s not. People are still trying to figure out the differences between hemp vs. marijuana. Some products are labeled cannabis, others marijuana, and others hemp. Is there any difference between hemp and marijuana? If so, how can you tell the difference between one species and the other? Here is your comprehensive guide to all questions about hemp vs. marijuana, as well as a few clarifications on the term cannabis. What does each type look like and what are the chemicals compounds inside? Don’t forget about the ways you can use each subspecies and the legal quagmire. This article should cover just about anything you might want to know. Depending on who you talk to, you might get different descriptor words for cannabis, marijuana, and hemp. The words are often confused. Different words are used to a brand’s advantage as they try to boost sales or avoid regulatory issues. Officially, and in this article, you should always use the following definitions. Cannabis is the family of plants that covers all the subspecies. Both hemp and marijuana fall under the cannabis genius but have very different qualities. Humans domesticated cannabis millennia ago and used different types for a myriad of uses. For example medicinally, ceremonially, as foodstuff and for industrial pursuits. There are three known subspecies of cannabis including cannabis indica, sativa, and the less common ruderalis. Hemp, at least in North America and Europe, is a word used to describe the types of cannabis grown for their stalks, seeds, and leaves. Although recently many companies are using hemp for CBD production, traditionally hemp was used as an industrial material for cloth, paper, and sails. Legally, hemp cannot contain more than 0.3 percent THC (in the United States), meaning it’s impossible to get high from hemp. Marijuana is technically what made the plant so infamous across the US. Growers cultivated marijuana over the centuries to have increasingly higher levels of THC and other medicinal compounds. Marijuana is grown today mostly for its flowers (the buds) and cannabinoid content. Although many individual states, as well as Canada and a few other countries, have legalized it, marijuana is still federally illegal in the US and many other places. What is the Difference in Anatomy Between Marijuana and Hemp? If you put a hemp plant beside a marijuana plant there are obvious visual differences. Hemp is tall, skinny, and much less bushy than a marijuana plant. Remember, hemp is useful because of its stalk, so the stalk is the most prominent part. Marijuana, on the other hand, should be much leafier with large, well-formed buds when it reaches the flowering stage. 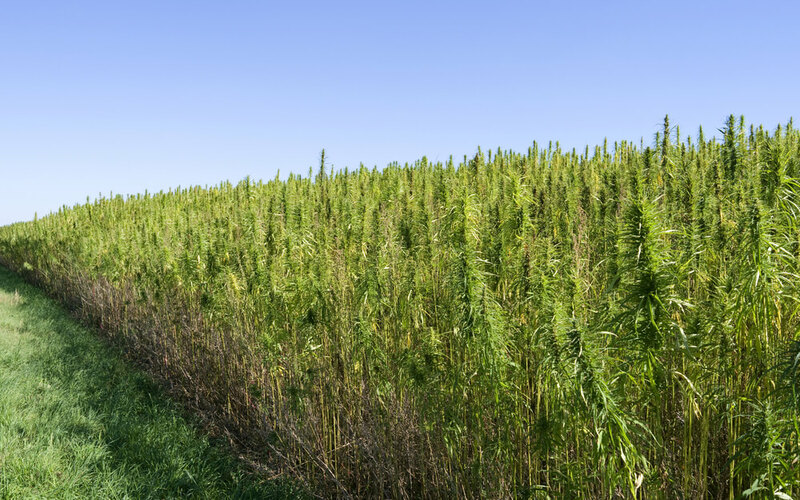 A field of hemp is grown more like a field of corn. Close together, machine harvested, on large acreages. 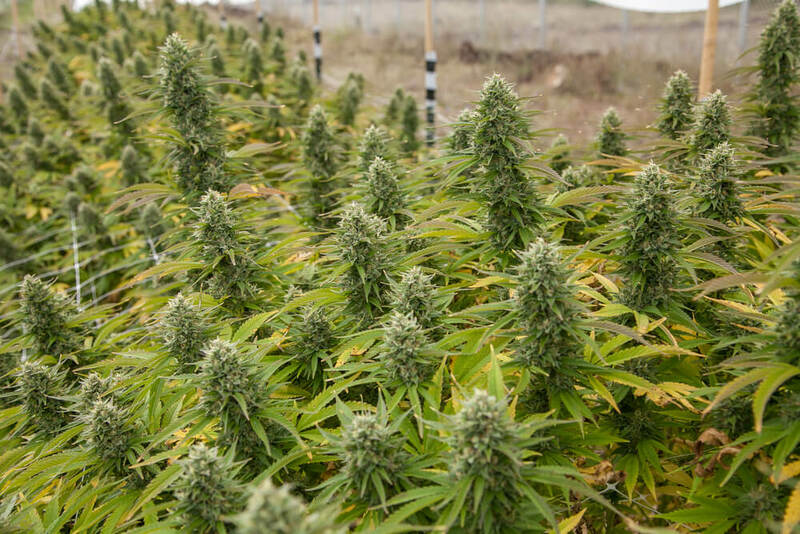 Marijuana plants require a more specialized growing environment. In tropical and hot arid climates marijuana grows well. Nowadays it’s also grown no matter the season in greenhouses and large indoor warehouses. There are two different types of THC potent marijuana, with two different appearances. There are also hybrids, which are combinations of the two and come in all shapes and sizes. Indicas are generally shorter shrubs and much bushier than their sativa cousins. Sativa’s, if left to their own devices can reach over 20 feet or more. Ruderalis is far less common. While it does contain some THC, it is very short and resembling a hemp plant than a typical marijuana one. What is the Difference in Composition between Hemp vs. Marijuana? As mentioned, there are legal limits to the cannabinoid content of hemp. In the US that means hemp needs to be below 0.3% THC. Other countries have different thresholds; In Europe, it ranges from 0.2% THC to 1% THC. Although the ratios will vary depending on cultivar and climate, hemp does contain high levels of lesser-known cannabinoids like CBN, CBD, and CBC. Hemp is technically legal to grow in many countries, even if THC-laden marijuana is not. Many CBD companies have started harvesting hemp for their tinctures and oils. According to some measurements, there are over 500 different chemical compounds found in industrial hemp. The entire plant is used during extraction to get the most out of the plant because technically hemp contains far lower cannabinoid concentrations than marijuana. Marijuana’s cannabinoid content is much better understood, and increasingly useful for recreational and medicinal purposes. Some marijuana is up to 30 percent THC, with at least 103 other identified cannabinoids as well. Marijuana also has various terpenes, which are essential aromatic oils, that lead to the many flavors we know and love. Pineapple Express and Blueberry Kush are only some famous examples of marijuana terpene profiles. It’s what makes each strain unique. Terpenes are also thought to change the experience and medicinal benefits of the plant, just like cannabinoids. What are the Different Uses for Marijuana and Hemp? Hemp is useful as an industrial material. The word cannabis comes from the word canvas because the plant was initially used to weave the canvas of sailing ships in the oceans around Europe. It was so useful as fabric, that hemp was one of the first plants brought over by the colonialists to North America. Hemp is very versatile. You can make paper products from it, including hemp rolling papers. You can also use it as the basis for environmentally friendly building materials including hempcrete, a hemp-based concrete, and hemp plastic. As scientists and product developers continue to tinker with the compounds in hemp, the plant becomes increasingly useful. Beyond industrial materials, the seeds of the hemp plant contain valuable nutrients and oils. You can buy hemp seeds in health food stores, and hemp oil is one of the healthiest cooking oils out there. Marijuana, is useful as an intoxicant, thanks to the THC cannabinoid which triggers a high. It’s also increasingly proven as a medical benefit, thanks to all the cannabinoids and terpenes. Some proven medicinal uses are for chronic pain, inflammation, cancer co-therapy, an anti-tumor, and much much more. As the plant becomes more accessible to study, there will likely be more developments. What is the Legal Difference Between Marijuana and Hemp? One of the glaring differences between the two types of cannabis is the legal ones. But it doesn’t make the differences any less complicated. Technically speaking marijuana is still illegal at the federal level in the US, but other countries like Canada, have started to open up the regulations for both recreational and medicinal purposes. There are now more than 30 states in the US which have also changed their state laws to allow for at the very least medical access to the plant. Hemp was also illegal to cultivate and produce in the US until very recently The Farm Bill in 2014 opened up some cultivation and the newest rendition of the Farm Bill in 2018 loosened the regulations even further. Thankfully, it is no longer a controlled substance in the US. Hemp doesn’t have as many issues in other countries around the world. In a lot of ways, the resurgence of hemp production around the world has changed the way we all look at cannabis. Even the American government, a long-standing stick in the mud about cannabis, has reversed its prohibition on hemp. Soon, if the individual state laws are anything to go by, they may also shift their opinion on medical marijuana. 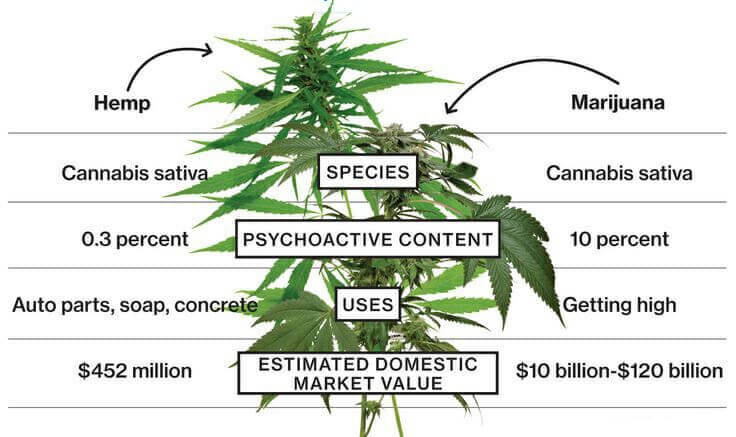 While hemp and marijuana are from the same species of plant, they are still very different. To a well-trained eye, they look drastically different and produce very different results. We also use them for very different purposes, so much so that they are regulated in different ways by the various regulatory bodies. Anatomy: Hemp is tall, stalky and cultivated like corn. Marijuana is often very bushy, and when flowering, top heavy. Nobody has ever complimented a hemp plant for the size of its buds. Composition: Hemp contains only trace amounts of THC, less than 0.3 percent by law. Marijuana on the other end of the spectrum can have up to 30 percent of more THC. Legality: Thanks to the Farm Bill, approved in 2018, hemp will soon be legal to grow, process and sell all across the US. It’s also legal in many other countries. Marijuana, especially for medicinal purposes, faces more restrictions. There are 32 states and 35 countries (and counting) which have approved legal cannabis.